BACK IN STOCK!!! Here's some classic d-beat tunes from a pioneering band for the d-beat swedish punk. 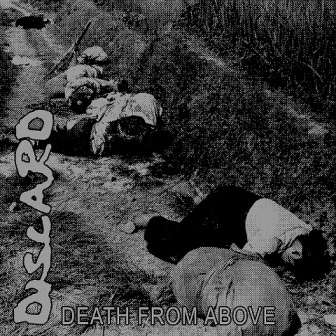 Discard was formed in early/mid 80's and members were involved with bands such as Mob 47 & Protest Bengt (Åke, Chrille) and Agoni (Per). They were one of the first bands that gave breath to the Discharge worship in the Swedish scene the latter years. Death from Above EP was released by Jesus Kudd records in 1990 and was much later re-released by Rodel Records and it consists of six dis-tracks coming straight outta the Discharge recordings of the "Hear nothing..." era, nothing more or less than that.